I'm going to briefly hijack the Website to promote a little project I'm currently involved with. Or, with which I'm currently involved. Whichever is gooder English. As you may know, I spent some time watching Doctor Who from the beginning. As in, from 1963 to the present. Sure, you remember. 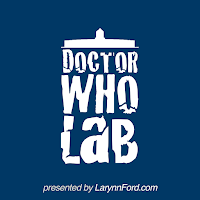 Anyway, after that, I introduced Larynn Ford (an author in my local area) to Doctor Who. She was intrigued enough with the show after meeting Colin Baker last year at DragonCon that she decided she wanted to watch it. But, she started with Christopher Eccleston, and watched all the shows up to the new season. (She still hasn't seen any Colin Baker episodes.) She liked the show a lot, so we decided to start a podcast. Which is just what the world needs: another Doctor Who podcast. What do we have to offer that's different? Well, we plan to watch all the episodes and talk about them. All the episodes. All 800+ episodes. Every last one of 'em. Anyway, we have two different perspectives looking at the same thing. Maybe it'll work, maybe it won't. If you want to hear this train wreck, you can find them at LarynnFord.com. It's also on iTunes (links are at LarynnFord.com). Now, back to teh funneh. Looking forward to checking out the podcasts. And pardon the possible heresy, but "Blink" is my favorite episode. "Blink" is indeed a good one. If you have a question about any aspect of the show that you want us to address, let me know. Leave it here, or at her Website. I forgot how great your voice was, Basil. You've got Georgia on your mind!